Kenji Kamiyama's ANCIEN AND THE MAGIC TABLET was the closing night film of this years New York CHildren's Film Festival. It had only premiered hours before in Japan and Kamiyama had crazily hopped a plane to New York to oversee its international premiere. When it was done there were cheers, a Q&A and a signing. It was a film that blew everyone away. I suspected GKids would be releasing it and I ask the head odf the company Eric Beckman if they would be releasing it and he gave me a no comment as he left the theater. 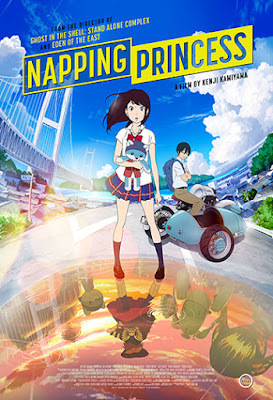 However they started to promote the retitled film when, it's now called the more appropriate THE NAPPING PRINCESS, I knew they the rights. What follows is my review/report from that premiere NYICFF screening. It is slightly altered but is mostly my thoughts on seeing it that first tim. THE NAPPING PRINCESS concerns Kokone a teenaged girl who is just about to go on summer vacation. Living with her father, a hot shot mechanic, she frequently dreams she is Ancien, a princess with magical powers and a magical tablet. When Kokone's father is arrested by the police on word from a car company executive who wants the driverless technology he has perfected- Kokone's is forced to rescue him- with her dream world crossing into the real world. This film is freaking awesome. This film moved me and filled me with genuine awe. For one of the few times in my life I watched with film with a heavy heart because my friends who will one day love this film to death couldn't be there to experience it's wonders with me. I wanted them- and you dear reader- to experience this films wonders right now. What is the film like? In someways like every anime and manga you've ever seen. There is fantasy and science fiction, talking stuffed animals, steam punk, mechas, romance, magic and anything you can think of. director Kenji Kamiyama said in the Q&A after the film that he intentionally designed the film to blend our lives, our dreams and the stories we hear, all together because that's how he remembers and sees the world with life, his dreams and movies all blurred together. The result is the film will remind you of the best of everything but it then fashions into something new. The more you know the more you'll go "oh that is like X" but its like it not exactly it. Watching the film I could see the references but at the same time I didn't care because what happens is ultimately it's own thing. Kamiyama. In a weird way it's kind of like what Quentin Tarantino does but not as obvious. You could watch this and know nothing and still love it to death. What I absolutely love about this film is it's exactly like the story Kokone's father tells he about Ancien. its a film with everything in it. Honestly I will be happy to let Kamiyama dream for me if I can get lost in a film as wondrous as this. I can't tell you how much I want to tell you everything that happens in this film and throw out all my thoughts but that's not right, this is a dream you need to have for yourself. You have to see this on the big screen. One of the best films of 2017 and I'm going to go out on a limb and say that it's got a shot at an Oscar nomination next year as well.